What Is an Umbrella Used for When Taking Photographs? When taking photographs in a situation that requires supplemental lighting if you think that an umbrella is used to keep equipment and photographers dry, you would be mistaken! A photography umbrella is a key tool in a photographers kit which is used to soften and diffuse the light produced by an off camera light source such as a flash unit. 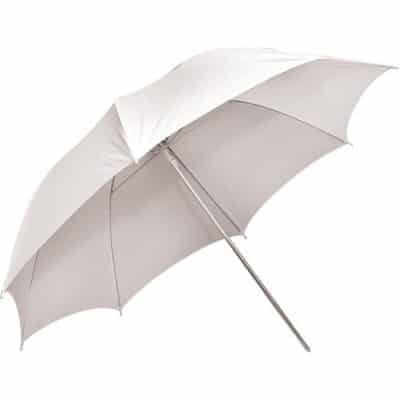 White translucent umbrellas diffuse and spread harsh light, silver reflective umbrellas throw light over a 180 degree field, and Parabolic umbrellas focus flash light. When using an umbrella the off camera light source is pointed into the umbrella, when the light is fired it is directed into the umbrella which then diffused and redirects the light. Positioning of the umbrella controls the overall direction of the lighting.